Hospital consultants will have to work at weekends under a seven day NHS, said the Health Secretary as he suggested that their refusal to do so is contributing to 6,000 deaths a year. Prime minister David Cameron has repeatedly raised concerns that patients are up to 15 per cent more likely to die if they are admitted to hospital on a Sunday compared to a Wednesday because of the poorer service at weekends. "I will not allow the BMA to be a road block to reforms that will save lives," said Hunt. 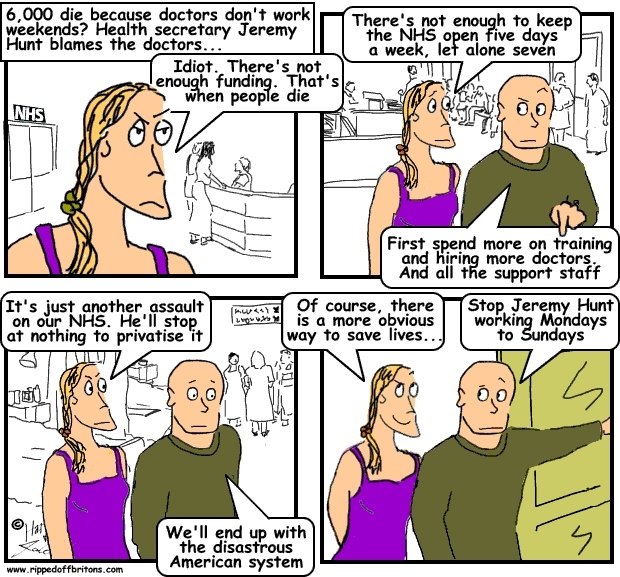 Consultants are the only health service workers still entitled to opt out of working at the weekend. Under their present system, a consultant with average earnings of £118,000 can boost their basic pay by a third by waiving their opt out and choosing to work at weekends. Some earn more than £200 an hour. The plans triggered a furious response from the British Medical Association (BMA), which accused Mr Hunt of a "wholesale attack" on doctors. The BMA said: “Doctors support more seven-day hospital services [but] have repeatedly called on the government to outline how they will fund and staff them”. The health secretary, Jeremy Hunt, expressed doubts about the future sustainability of the funding system that has existed since the service’s creation in 1948 after delivering a speech setting out his “25-year vision for the NHS” in London on Thursday. His comments come days after David Prior, the ex-Conservative MP and hospital trust chairman who recently became a health minister in the Lords, warned that the premise of a tax-funded model would have to be questioned if patient demand for care outstripped economic growth. Shadow health minister Jamie Reed said: “It could mean charges for treatment are just around the corner. Prior to the election American doctors warned that the Tories were taking the NHS down a path towards a US-style system and it now looks as if this was a prescient warning.” Hunt told NHS leaders in his speech at the King’s Fund that he supported the way the NHS was currently funded as the best model. “But I think the principle that sits behind it is one that we all feel very strongly about. Social equity is at the heart of what the NHS stands for. It’s what makes the British public say time after time it is what makes them most proud to be British... But if we’re going to continue to deliver that we have to be ambitious about new models of care,” he added.